It started with turning decreases into decorative elements. I love to add texture to knitting. The most common way I do this is with the Showy Decrease. The Showy Decrease strings together a line of decreases that rise up on the face of the knit fabric. As you can see in the Cassini Shawl shown on the right, they work especially well when running in contrast to a series of color stripes. Creating pleats that hold and knitting faux cables are two other fun ways to use this technique. 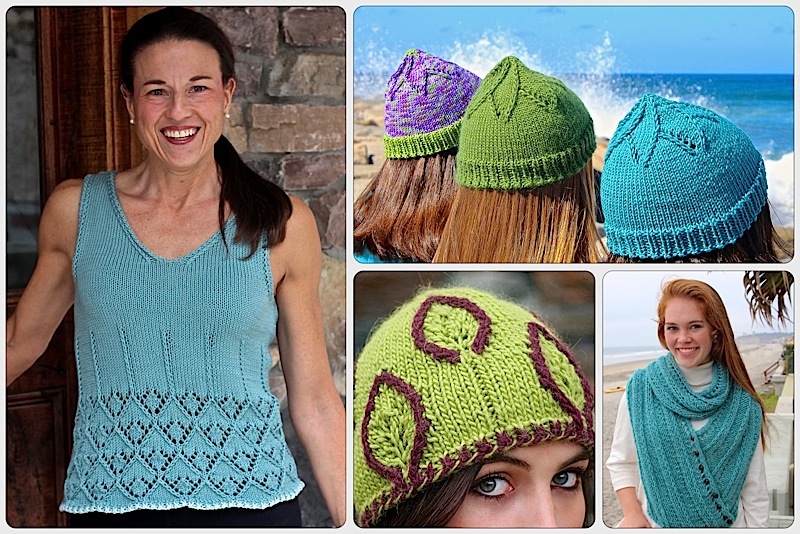 You can find both of these free patterns in our Ravelry store. Time to switch our attention to increases. I was in search of an eyelet with enough gravitas to partner with the Showy Decrease. Specifically, I was looking for a double increase that would send two Showy Decrease lines off in opposite directions, a replacement for [yo, k1, yo] which tends to bunch. Two great tastes that taste better together. While some of our Nuances, like the Flat I-Cord and Showy Decrease are new, many of the ideas are based on knitting techniques you already know and love. Sometimes I tweak them and sometimes I combine two techniques for a more impactful result. Knotted K2Tog Bind Off which combines the k2tog bind off with a standard psso bind off. The knit 1 back and front increase which reverses the order of the k1f&b for a less intrusive increase. The Garter Stitch Seam that turns the 3 needle bind off inside out. Take a look at the eyelets to the left and see if you think I met my goal to create an eyelet that stands out even after blocking. First of all, I do love the structured look. You can use this as a stand alone increase but the eyelets look even more dramatic when strung together in a line. And, as you’ll see in upcoming patterns, I’ve already started to use them in a variety of ways. So, what 2 techniques did I combine for this concoction? Knit 1, yarn over, knit 1 into the same stitch and … knit 1 in the row below. That means you will work the double [k1, yo, k1] increase, not into the stitch currently hanging on the needle, but into the hole in the stitch just below it. The stitch that was created when you purled on the prior wrong side row. Wand to see how it works? Just link to the Knitting Nuances You Tube Channel for our free tutorial video. Here’s a look at the complete swatch. It illustrates how you’ll be able to see these increases in your knitting. This photo may have already given you an idea of how you could use the Porthole Eyelet in patterns you already have … a triangle shawl! The swatch includes 3 elements I think are important when knitting a triangle shawl. This tiny swatch is the perfect opportunity to give these new techniques a try. Add your own design elements to the body of the shawl and you can use this template again and again. Want the shawl to increase more quickly? Just add a yarn over or k1b&f inside each 4-stitch Hatch Edge. Go grab some needles and give it a try. Not only will you have some fun, when you’re done you will have added three new knitting techniques to your bag of tricks. You’ll start to spot ways to use them in other patterns and they’ll give you an opportunity to personalize your projects. This is one of my favorite Nuances. You can read about it in this blog post and find a tutorial video tutorial on my You Tube Channel. Take a moment to read the blog post about the Hatch Stitch edge. These 4 Stitches Will Instantly Improve Your Knit Edges. It explains why it works and has a link to our You Tube Channel with a tutorial video for both the Showy Decrease and Hatch Stitch Edge. And finally, welcome to the literally hundreds of Knitting Paradise forum readers who joined the blog this week. Once again you have demonstrated how you love knitting techniques. On a personal note, you gave me the morale boost I needed to start blogging again after a necessary but unwanted hiatus to deal with my Lyme. Thank you so much for becoming part of our Nuance community. How lovely to hear from Knitting Nuances, Laura, and I do hope your Lyme is now manageable. I’ve knitted for over fifty years, and yours is by far my favorite blog. I joined a while back after looking for (and finding!) flat i-cord edging, something my grandmother used a lot, and I was racking my brain trying to remember the steps. You saved me, and I’ve been a fan ever since. Thanks for the great tips and the inspiration. I look forward to reading more. Thanks Megan, You made my day. I am thrilled to be back to blogging! Hi Deb, the first thing I do when I publish a post is go to the I’ve site and test all the links. They worked for me. I’m afraid I can’t think of what could cause your problems. If you go to the bottom of the blog you will see a menu with all the categories. You should be able to find the topics there. Hi Laura, can you spend a short video with Introducing the Porthole Eyelet. I cannot understand what I shall knit. Sorry. Yes, this is on my list. I will try to get to it in the next few days! Thank you so much. One short spot says more than many words. Great. This entry was posted on August 22, 2018 by Laura Cunitz in Nuances, Other Nuances and tagged double increase, knitting increases, Knitting Techniques.